I recall my Great Grandmom Annunziata making homemade Ravioli way back in the day. I was only a young boy but she let me use the fork to close up the dumplings. Never have forgotten that. 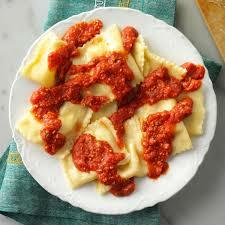 Ravioli are a type of dumpling comprising a filling enveloped in thin pasta dough. Usually served in broth or with a sauce, they originated as a traditional food in Italian cuisine. 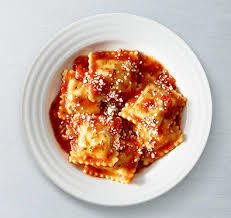 Ravioli are commonly square, though other forms are also used, including circular and semi-circular (mezzelune). The earliest known mention of ravioli appears in the personal letters of Francesco di Marco Datini, a merchant of Prato in the 14th century. In Venice, the mid-14th-century manuscript Libro per cuoco offers ravioli of green herbs blanched and minced, mixed with beaten egg and fresh cheese, simmered in broth and seasoned with “sweet and strong spices”. 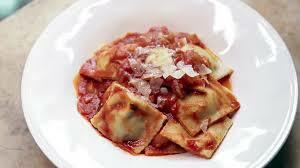 In Rome, ravioli were already well-known when Bartolomeo Scappi served them with boiled chicken to the papal conclave of 1549. 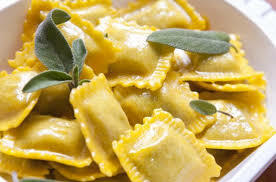 Ravioli were already known in 14th century England, appearing in the Anglo-Norman vellum manuscript Forme of Cury under the name of rauioles. 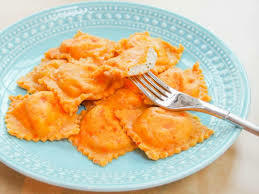 Sicilian ravioli and Malta‘s ravjul may thus be older than North Italian ones. Maltese ravjul are stuffed with irkotta, the locally produced sheep’s-milk ricotta, or with gbejna, the traditional fresh sheep’s-milk cheese. In Europe and the United States, fresh-packed ravioli have several weeks of shelf life. Canned ravioli was pioneered by the Italian Army in the First World War and was popularized by Heinz and Buitoni in the UK and Europe, and Chef Boyardee in the United States. Canned ravioli may be filled with beef, processed cheese, chicken, or Italian sausage and served in a tomato, tomato-meat, or tomato-cheese sauce. Toasted ravioli (ravioli that have been breaded and deep fried) was developed in St. Louis, Missouri, and is a popular appetizer and snack food. But these, handmade by Gina are the Real Thing.